Canadian newspaper The Globe and Mail will launch a metered paywall on Monday (22 October), as it introduces its new digital subscription package 'Globe Unlimited' covering access to content across digital devices. According to a post by media reporter Steve Ladurantaye, the model will give five or six day print subscribers free access to the website and the Globe and Mail's apps, while weekend subscribers will pay $4.99 a month for unlimited access. The news outlet is offering non-subscribers a one-month trial for $0.99, and will then charge the standard rate of $19.99 a month. Users will be able to access 10 articles a month before they will be charged, and "some components of The Globe's site will continue to be free to everyone," Ladurantaye adds in the post. "Readers will be able to watch an unlimited number of videos, get stock quotes and read 'letters to the editor'. "And readers who find stories through social media sites such as Twitter and Facebook as well as search engines and blogs won't have those stories count against their monthly cap." Speaking to Journalism.co.uk via email, Ladurantaye added: "I don't think any paper wants to be left out of the broader social conversation that happens around its articles and if you clamp down too heavy then you're excluding yourself". "By letting social media/search traffic through, papers are building their brand around the world and driving new readers to the site who may choose to become full-time readers." In an interview posted on the Globe and Mail editor-in-chief John Stackhouse said the new model will enable the news outlet to "put more resources into digital journalism, for the running of our website but also for the creation of original journalism". "We've seen hundreds of newspapers around the world, quality newspapers, moving to a pay model over the last 18 months and by and large it's working." He added that examples such as those at the New York Times, Financial Times, Wall Street Journal "are finding that consumers will pay for great journalism". "They're also paying for a great experience and we'll deliver both." Asked what the model will offer for users, he said it "gives them better journalism", with the news outlet aiming to be "more active in the morning" and "more engaged". New features include a "dashboard" which offers a personalised news experience. As Ladurantaye points out in his online post, The Globe and Mail's move follows the August launch of paywalls by another Canadian publisher Postmedia for several of its newspaper websites including the Vancouver Sun, The Province and Ottawa Citizen. 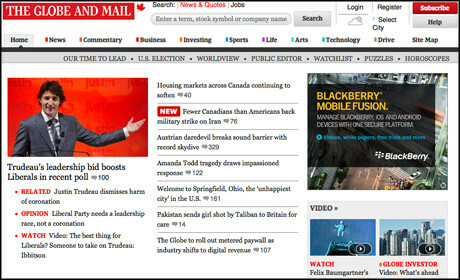 The Globe and Mail has also previously charged for some content, although this was removed in 2008. Former technology writer Mathew Ingram wrote about this at the time. Ladurantaye told Journalism.co.uk today that these charges were for content such as archived articles, and that while he was not working for the title at the time, "the technology that newspapers are using today to manage their paywalls would have been unimaginable back then". He added: "Things were different in 2008 - papers just weren't going the route of charging for online content. But we've reached a point in the industry where giving things away isn't going to work for much longer."